Great location - Boscombe Beach. 2 Bed GF Apt. Private SF garden. Own parking space. Review of Boscombe Beach. 2 Bed GF Apt. Private SF garden. Own parking space. This is our second year at this apartment and we will definitely be returning again. Liz is a lovely woman and always available if you need her. This apartment is very lovely in side and has everything thing that you could need when on holiday. It is nicely placed with the beech across the road and has a lovely patio to sit in. You will not be disappointed if you book this apartment. Thanks so much for taking the time to do a lovely review Steve and Tracey. Great to meet you at last. Thank you also for leaving it all so immaculate when you left...it didn't look as though anyone had stayed there . Hope to see you next year. Thanks so much Dave and Jenny for a very nice, honest review and taking the time to do it. You had such perfect weather, I'm so pleased for you, it just doesn't get any better than that. Thanks very much for watering my plants ;-). Best holiday rental we've ever stayed in. Apartment beautifully decorated, very comfortable and has everything you could ever need. Location is great too - we had lovely walks along the cliff and down to the beach. Liz is a fabulous landlady who ensures that everything is organised for your arrival and is brilliant at looking after her guests despite never meeting her! We hope to return and stay here again - amazing value for money. I'm so glad you all had a lovely time Mary and that the weather was pretty good for October!! Whatever time of year it is a lovely area and location and thank you so much for your lovely comments about the apartment. I'm really pleased to hear it was perfect for your family holiday. Many thanks for taking the time to write a lovely review on my apartment and your holiday. I'm so pleased to hear that all three of your kids enjoyed the beach so much ;-). You had great weather too.... always a bonus. I hope you feel rested and the boys ready for school again??. We have just returned from a fabulous week's holiday. The apartment is first class, modern, spotlessly clean and with everything you could possibly need, including buckets and spades for the children. 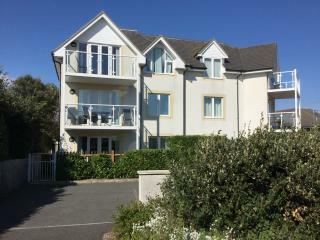 The location is perfect with a cliff-top sea view, a lovely walk down to Boscombe beach. The centre of Bournemouth is within reach although we chose to make the journey by car. The patio area at the front of the apartment is perfect for breakfast or just watching the world go by, with low hedging for added privacy. The Bowling Club is maybe 150 yards away and serves a wide selection of good value meals and very welcoming staff. Liz was the perfect host, very genuine and in regular touch with us throughout to answer any questions and ensuring we all had a good time. All in all, a perfect holiday and we would definitely come back again. Dear David, Sarah, Diane and Luke. It was so nice to at last meet my guests!! I know you really made the most of your stay and fitted in as much as possible, it was clear you were all having a lovely time. I am so pleased and thank you very much for your lovely review. You were so lucky with the weather (most of the time ) and I understand that the Air Festival being on while you were here was a bit of a bonus as you hadn't realised when you booked it. Right from the first interaction with the owner Liz, we got a good feeling about our booking. The only week available was the week we were looking for and having read the reviews we booked straight away. Liz was in regular contact before and during our stay. The flat is immaculately done out to a high standard with all the kitchen equipment you could require. It is like a home rather than a rental flat! The garden is packed with flowers and the walls covered with classy seaside artwork. The beds are comfortable and the two bathrooms spotless. The south facing patio is a lovely place to sit for breakfast or dinner and you get a peek of the sea while chopping veg in the kitchen! The flat is just a moment's walk from the top of the cliff where you can see the Isle of Wight, Boscombe and Bournemouth pier. Sainsburys is nearby by car and the bowling club a couple of roads away along the front serves great lunches. The zigzag path to the beach is just along the front and there is a lifeguard swimming area at the bottom. If anyone like to play Pokemon Go there are lots of Pokestops and Lures at Boscombe Pier as well as some nice cafes. The Shelley theatre is a short walk away and there are national plays at the Pavillion Theatre in Bournemouth, where there is also great shopping. 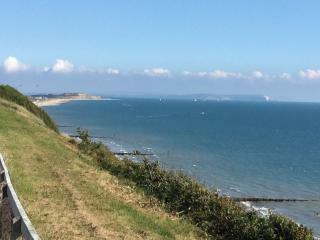 If you walk to Bournemouth along the front it is a fabulous walk into the evening sun and a taxi back is about £9. We can not recommend the apartment and location more highly. Thank you Liz! It was a pleasure!! It seems like you have really made the most of your time there and have been out and about a lot. There is so much to do in the area, it's great to have so much choice. Thanks so much for your lovely informative review with lots of tips and advice for people. We stayed here for 3 nights over the May Bank Holiday weekend, and were delighted with our choice of accommodation. The apartment was clean and comfortable, and tastefully decorated, and the small patio area proved to be a great sun trap for a leisurely breakfast, or a lazy afternoon. Liz was a great hostess, keeping in touch by text and email so we knew who to contact if there were any issues (which there weren't! ), and the card and gift to welcome us was a lovely personal touch. 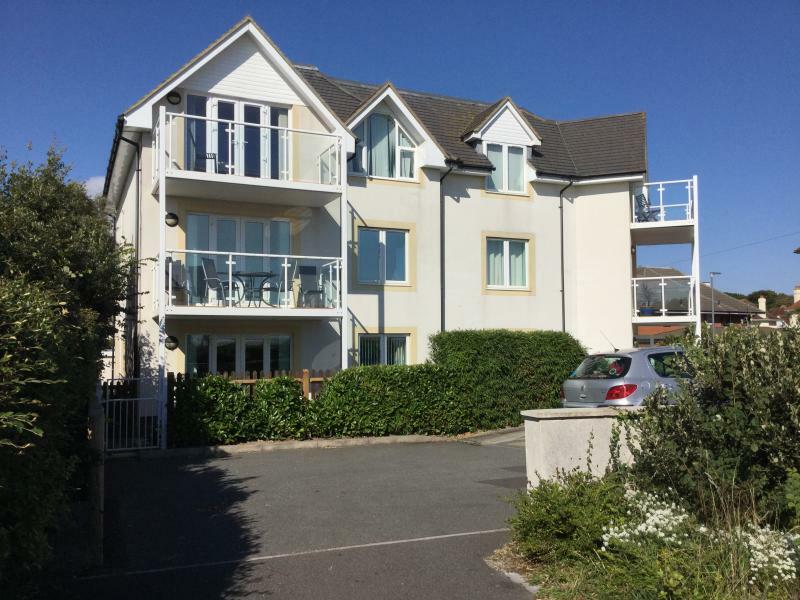 We would definitely recommend this apartment to anyone looking for a modern apartment, close to the sea, ideally situated for short trips to Bournemouth or Christchurch, or for exploring further afield. Thanks so much Julie for taking the time to send this in and for your lovely comments. I'm so glad that you enjoyed your stay and it was convenient for you to visit your family. The flower bed is now unrecognisable, completely stashed full of plants and colour. I am currently trying to update the photos, hopefully over the next couple of weeks. I really appreciate your honest review. Looking for a place to stay in Bournemouth?